In Bahrain, the main industry of the country used to be diving for pearls. A rich heritage of perfecting the art of pearl diving prompted designers to create something truly special. The Pearl Monument, located in the city of Manama, is a common tourist attraction that is seen by countless people from all over the world. Taking a tour of this wonderful city has more to offer than the Pearl Monument, but for the sake of the article, let’s stay focused. The Pearl Monument is made up of 6 Arab ship sails that are pointed toward the heavens. The 6 sails cradle a gigantic pearl that signifies the dedication to the pearl industry of old. 6 Arab countries come together in unification and respect for one another’s working talents, which is why 6 sails were used. One for each, representing Saudi Arabia, Kuwait, United Arab Emirates, Qatar, Oman and Bahrain. The structure truly is magnificent, and while it may not come close to the audacity of some of the more expensive structures, it holds cultural significance that is second to none. The road around the Pearl Monument is busy with cars driving speedily on the roads near it, so getting a clear picture of just the monument will take some patience. This landmark is very special to a great many people with a family history in the area. It’s a constant reminder of the life that was lived before the development of modern day technologies. 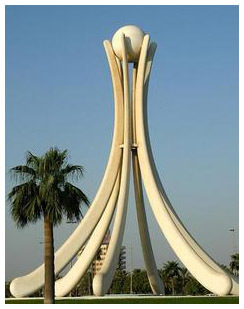 There are also other landmarks in Bahrain that have significance. The King Fahd Causeway, which connects Saudi Arabi and Bahrain, was started in 1968. They finished building the causeway in 1986, for a total cost of 1.2 billion dollars. The Ballast Nedam Group was contracted for the job as one of the main construction and engineering companies from the Netherlands. 3,800,000 square feet of concrete and 47,000 metric tons of steel were used in its construction. Made up of a total of three segments, the causeway connects Khobar to the Saudi-Bahrain border, from the Saudi Bahrain border to Nasan Island in Bahrain, and from Nasan Island to the main island of Bahrain. As a four lane highway, trekking across this gigantic concrete and steel structure is a treat for the eyes. Visually pleasing and beneficial to life in Bahrain as a whole, this causeway should be one of the major tourist attractions you should visit. Be sure to make reservations to do some things in Saudi Arabia or Bahrain before you go in order to make your trip across the causeway a thoroughly purposeful experience. These are the modern monuments, buildings, and tourist attractions that we saw fit to include in this article. If you talk with some of the representatives of Bahrain, you may find out there is much more to experience than you think. However, in all fairness to the region, these are the landmarks that really stood out. If you will travel to Bahrain check this out too!